Volunteer Energy Cooperative’s (VEC) multi-year project of renewed emphasis on right-of-way clearing and pole inspections is intended to reduce the number of outages and the duration of outages when they do occur. 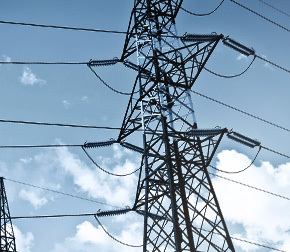 When major weather events occur, we are seeing fewer outages resulting from these events. In 2005 VEC began an aggressive right-of-way clearing and pole inspection program that includes right-of-way clearing, right-of-way spraying, and pole inspections. VEC maintains about 9,000 miles of line and about 190,000 poles. In Fiscal year 2012-’13 VEC and contract crews trimmed 2,029 miles of right-of-way, sprayed 4,027 acres of right-of-way, and inspected 12,755 poles. About 85% of all power outages are caused by trees or tree limbs coming into contact with power lines. One of the great things about this part of Tennessee is the abundance and variety of trees that beautify the area. But when tree limbs grow to the point of threatening power lines, Volunteer Energy Cooperative (VEC) has no choice – the tree must be trimmed. 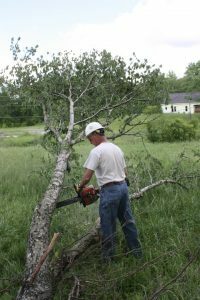 VEC’s certified arborist Steve Scott says that, before VEC crews or contract crews trim a tree, every effort is made to notify the property owner. But in some cases when the property owner cannot be notified, crews will still be forced to trim. Scott said trees located near power lines must be pruned periodically to prevent power outages and damage to equipment. He added that VEC uses the natural/lateral cut method that is recommended by the National Arbor Day Foundation, the International Society of Arboriculture, the National Arborist Association, and other professional trade organizations. VEC’s R.O.W. spraying program typically runs from mid-June through September when growth is most active. During this fiscal year VEC sprayed 4,027 acres. The spraying helps prevent extended power outages caused by falling trees and to assist with quick power restorations by improving access for service crews. VEC will only use EPA-approved herbicides that are rated the safest, use them in lowconcentrations, and deploy them with selective backpack spraying. VEC also maintains an aggressive pole inspection/replacement program as preventative maintenance. With nearly 190,000 poles on the VEC system, the pole inspection/replacement program is a non-stop effort. The Inspection crews, which typically consist of four to five members in pick-up trucks and sometimes on ATV four wheelers, carry VEC Contractor identification and pick-up trucks also display VEC contractor identification. It is not necessary for customers to be home during the inspections and power will not be affected. Check this box if you would like to be contacted by a VEC representative.